Protein rich: Quinoa is a complete protein, meaning it contains all 9 amino acids that are essential for our complete nutrition. Complete proteins are rare in the plant world making quinoa a great source of protein for vegetarians. High in fiber: Quinoa contains almost twice as much fiber as other grains. Good source of Iron: Iron is essential because carries oxygen from one cell to another and supplies oxygen to our muscles to aid in their contraction. Contains lysine: Lysine is mainly essential for tissue repair and growth. Rich in magnesium: Magnesium also may reduce Type 2 diabetes by promoting healthy blood sugar control. Other health benefits of magnesium include transmission of nerve impulses, body temperature regulation, detoxification, energy production, and the formation of healthy bones and teeth. Now that you know some of great health benefits of quinoa, If you have not already added it to your diet, I highly recommend it. It has a delicious nutty flavor and you can add pretty much anything to it for a great side dish or main meal. So, if you are new to quinoa or are just looking for some different ways to throw it together here is one of my favorite quinoa salad recipes! In a medium sized pot add 1 cup quinoa and 2 cups of water, over med-high heat with lid on until it reaches a boil. Reduce to simmer with lid on and cook till water is absorbed. While quinoa is cooking toast almond slivers or pine nuts in a small non-stick pan on the stove over medium heat, stirring constantly to keep from burning. Set aside when done. 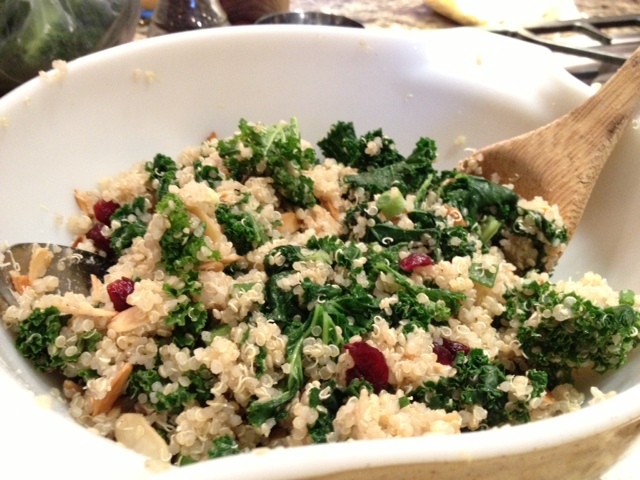 Once the quinoa is done add 3 cups raw kale to a large bowl. While quinoa is still hot add it to the kale and stir it up. The heat from the quinoa will help to wilt the kale a little bit. Add cranberries, almonds/pine nuts, green onions, lime juice and salt and pepper, stir it up till combined, serve, and enjoy! **Note: you can always add more of less of any ingredient, if you want more nuts and cranberries or lime juice, go for it! It is all up to your individual taste.